Combustion catalyst. 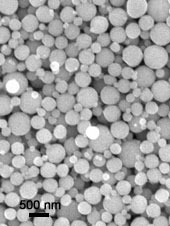 Nickel nanopowder works well as a combustion catalyst for solid or liquid propellants, with research suggesting viability in a host of other combustive applications. While it’s largely been ignored in energetics due to a relatively low energy density, the potential for nickel has been revisited as research into nanopowders resurges, with newer studies and theories suggesting new possibilities for its role in fuel production. Electronics applications. Many of the most common applications of nickel nanomaterials involve electronics in some form or fashion. The material has been utilized as a component or manufacturing aid for capacitors, electrode terminations, electromagnetic shielding, metal base electrodes, conductive coatings and pastes, ferrofluids, and more. Purification of Uranium. Promising research into the interaction between nickel nanopowders and uranium suggest it as a viable material for the purification of uranium. This makes it highly valuable in certain industrial applications and for certain environmental projects. Further research continues.